There are a variety of ways that rain gutters and downspouts can be damaged. However it happens, Bel Air Gutter & Siding can fix your downspouts and gutters and make them almost as good as new. In some cases parts will be new. If the problem is fairly simple, we can probably fix your gutter on the spot. 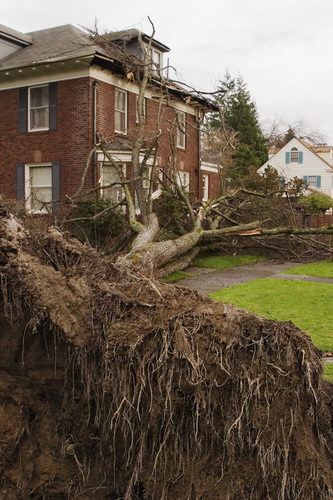 If the damage is more extensive we can give you a quote and recommend several options. 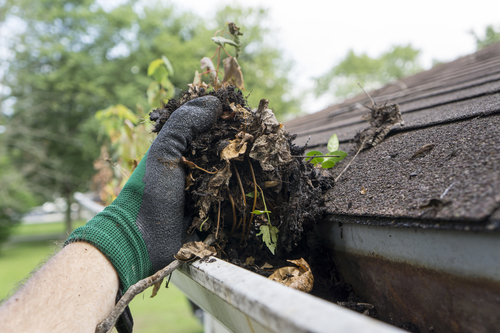 It may require ordering some parts or it may be best to replace your gutters. 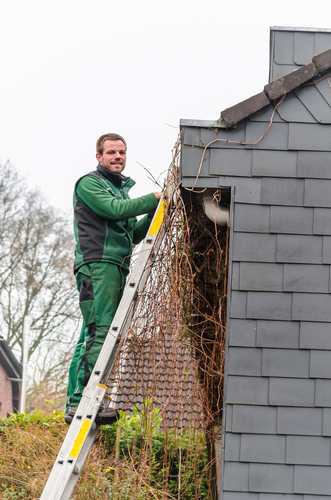 Replacing the gutters is the last resort and is usually done if there is damage and the gutters are fairly old. Normally, we might need to replace a section of gutter, or replace some hangers. We own houses too and even though it is our business, we wouldn't want to replace our gutters either. So we will only recommend this if it makes the most sense and will usually give some other options as well. For most peoople, their home is the most expensive investment they will ever make. If your gutters and downspouts are not properly maintained and functioning, it can cause damage that will decrease the value of your investment. Since most gutter repairs are not that expensive and the damage they can cause is costly, it makes sense to call and get your gutters and downspouts fixed as soon as you notice something wrong. That is also why it makes sense to get them cleaned regularly so a professional can look and see if anything is amiss. Gutters and downspouts are an integral part of your house and very important for moving water away from the house. It doesn't matter whether you house is large or small, a row house of a single family residence, it is critical that any gutter damage be repaired quickly. The longer you wait, the more expensive the fix is likely to be. Ice and snow damage - Hopefully just needs some replacement hangers. If bent and twisted, portions of gutter will have to be replaced. Falling tree or branch - Possibly just hangers, most likely sections will need to be replaced. Vines and Ivy damage - These can pull gutters down if thick enough. They can also cause damage to siding and the roof. 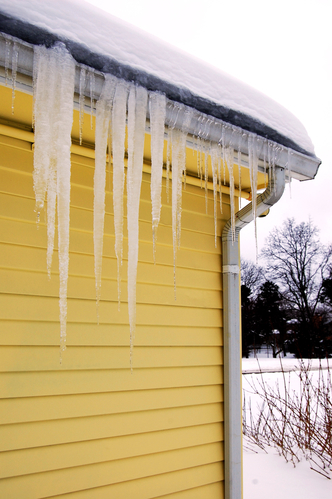 Damage from clogged gutters, downspouts - Extra weight can bend and damage gutters. Water can rot out fascia board and cause problems with basement and foundation. If you are a landlord or property manager, we work with a number in the area. We will help you maintain your properties and can even report back on anything we notice about other problems besides what we are working on. We routinely work with builders, contractors and architects involved in building buildings and homes as well as rehabbing them. Give us a call to see how we can help you. Gutters need to attach to something, especially if the side of the house or building is brick or block. Flat roofs are a bit different but typically roof rafters make up the peak of the roof that sheathing and roof shingles are attached to. The rafters are tied into the attic joists that the attic floor and top floor ceiling are attached to. Typically the joists and rafters extend a bit beyond the side of the house creating an overhang. At the outer edge of the overhang a board is attached that runs the length of the side of the house and is vertical. This is called the trim or fascia board and the gutters are attached to this. If this rots because the gutters are clogged and overflowing, the gutters can start to detach. The cost of replacing the fascia boards is fairly high because because of all the labor involved of taking off the gutters, replacing the boards and reinstalling the gutters. It pays to maintain the gutters properly. It is also why it is now common to cap or cover the fascia board with aluminum trim coil. This greatly reduces the chance of the fascia boards rotting. The shingles will extend a bit past the edge of the roof so that the water running off will go directly into the gutters. The last part is called the soffit. This is the underside of the overhang. If it was just the joists with no covering, too much air would get in and also potentially animals. However, some air does need to get in to prevent rot, so the soffit will have vents that allows some air movement. Soffits have typically been made of wood or a wood based product. Now, many people are using vented vinyl soffits because they can't rot, require no maintenance and allow somewhat greater air movement to prevent rot. While we are based out of Bel Air, MD, we cover Harford County. So if you are in Havre de Grace, Aberdeen, Abingdon, Churchville, Edgewood, Fallston, Jarrettsville or anywhere else in Harford County, Maryland, we would be pleased to have you as a customer. Bel Air Gutter & Siding can take care of any problem you are having with your downspouts, gutters, fascia, sofits, trim or anything else related to your gutters. Our belief is that it makes more sense to have long term customers than to overcharge and only serve you once. So our goal is to provide you excellent service and have the gutter repair cost be fair and reasonable.